Firstly a very short promo for the St. George's day celebrations. This was part of a days worth of filming for the Commandery Worcester, which is a wonderful civil war museum. Needless to say check out their events! The video below features much more of the footage from the day, but was edited later by their marketing officer. It was a really fun day full of running with permission slips in hand after families! This was filmed on my Canon 600D (Or rather the Rebel T3i) with some lovely vintage Pentax K-mount lenses. "This Green Earth" Exhibition Film from henry Fothergill on Vimeo. This was a Promotional video I was asked to produce to be played in an exhibition at the Worcester Art Gallery for Bridget MacDonald. The brief gave several prompts to ask Bridget but the interviewing itself was left to myself and Hannah. We ended up having a wonderful day with Bridget where the interview naturally took on a conversational tone, it helped that my Dad is an artist so we could freely chat about the nature of her work, and Hannah is exceptionally good at picking out prudent questions and bringing us back to topics from the brief, without stopping the conversation dead. I did struggle slightly with the sound as Bridget is very softly spoken and, alas, my equipment is somewhat lacking there. By somewhat I mean I had the camera sound (with a small Røde microphone attached) for the guide track and an iPhone 4 recording on voice notes next to Bridget! Still it got the job done! We filmed the day on my trusty Canon 600D with vintage Pentax K-mount lenses, now my usual set. I decided early on to focus on filming sections of the paintings, I didn't want to cut too much to entire paintings in part because paintings always look better in person (and they would be able to see them in the exhibition) but also because it allowed me to pick out details and features that Bridget had talked about in the interview earlier. Funnily enough Bridget was terribly embarrassed by the mess of oil paints in her studio but I loved the mess! Not only is it wonderfully photogenic mess, nothing there was dirty, it had a real artistic liveliness to the room, a real creative mess! This was also edited down to a promotional 40 second video which was put on the Worcester Art Gallery social media and homepage, promoting the exhibition. The exhibition itself ran from the 13th February – 25th June. "That classy classic condiment of choice for so many Britonic breakfast munchers, all those who love that unique tomato vinegarette enjoy this classy ad for the nations tastiest gunge. This was a Spec Ad made for the 2nd year of Bournemouth University Film Production and Cinematography (BA). Produced by William Geraghty and Directed by Henry Fothergill." This was filmed in one day on a Canon 5D Mk III in a tiny studio in our film department. The biggest mistake in this was using hot lights around food, in particular the cheese thins. After setting up for the first take the actor was unable to peel any of the cheese because the stack had all melted into one solid block, which of course we reset to get the shot used in the film, but not before the smell of sweating melting cheese had filled the studio, soaked into our clothes and dug itself deep into our noses. A lot of apologies were given to the poor schmucks using the studio the next day. One of the most fun parts of the shoot however was the food preparation itself, all of the food in the film was real food. It was interesting trying to cook a 20lb steak to look aesthetically pleasing and grilling sausages for just the right amount of crisping on the top. We did use a couple of tricks like having a spray bottle of water to make the parsley look fresher and adding oil to the steak to make it look freshly cooked. The pack shot proved most problematic of the whole shoot however as we couldn't move the lights to give enough brightness to the logo without also causing some nasty looking reflections AND rather unhelpfully HP sauce printed their best before dates on the white bottle topper. Unfortunately neither were something we could rectify on set or in camera so I took to photoshop afterwards. Because I have limited knowledge of After Effects I decided to export the packshot as an image sequence and correct it frame by frame, even though it's more arduous of a process I thought I would get a better result in our constricted timeframe on more familliar software. – Our alloted editing time was only 3 days long – In the end I don't think it's noticeable that it has been doctored, or that I did a similar process to hide a line in the studio wall behind the actor. I think in total I corrected 175 separate frames. This was a short promo that I made for Oxford Brookes, with which they would pitch the team to future investors. 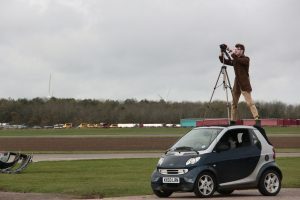 The footage was shot on two Canon 600D's by myself and a university friend, William Geraghty, over two days where the team were testing out their Formula Student car. 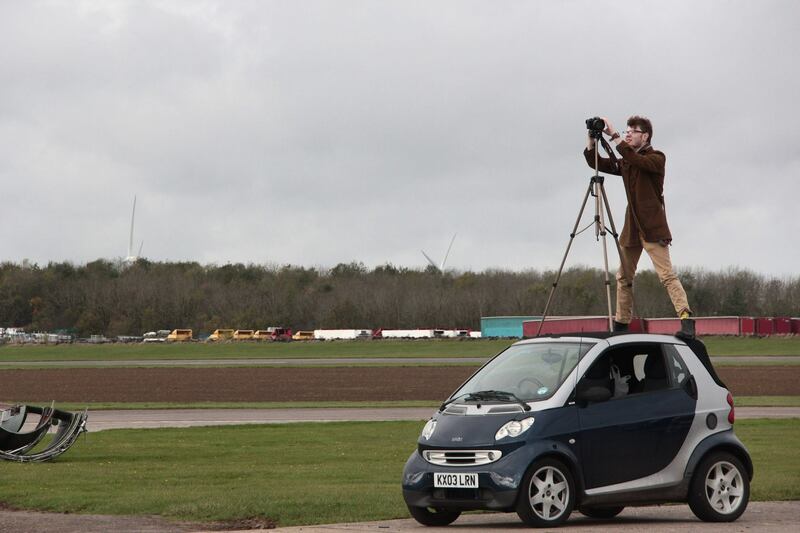 It was bitterly cold but I think we achieved some good results, particularly using my smart car with the roof down and William sticking through for the dolly shot!